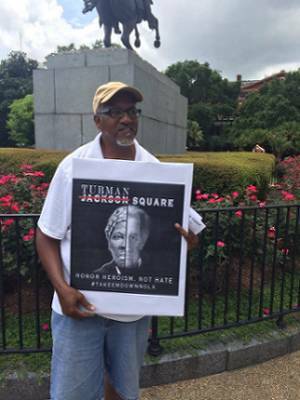 Malcolm Suber at protest demanding monument to Harriet Tubman replace that of Andrew Jackson. The monuments that were taken down, as well as those remaining, were all constructed in what we would call the Jim Crow era. Starting from the 1870s to the early 1900s, they constructed those statues throughout the South. 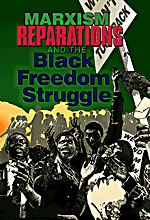 Their placement was an effort by the white supremacist plantocracy — the rule of the plantation owners — to take back all the tremendous gains that were won by the newly freed African people after the Civil War. Four statues were removed beginning in April and through May. They were of Gen. Robert E. Lee; Pierre Gustave Toutant Beauregard, the general who ordered the firing on Fort Sumter that began the Civil War; and Jefferson Davis, president of the Confederacy. The fourth, finally, was the white supremacy monument — what the white people in the city called the “Liberty Monument” — an obelisk that praised the assaults on the Reconstruction Government in 1874 here in New Orleans. We still have more than 18 white supremacy monuments left in the city. The mayor and City Council say they are “tired of spending funds” and they intend this to be the end. Take ‘em Down NOLA says this is just the beginning, an appetizer. We are fighting now for a resolution to remove all the white supremacy monuments and street names and public buildings named for the slavemasters. This is a struggle that will continue until we finish the main course. Regarding why there was such resistance among the politicians, well, if you understand the politics of Louisiana and New Orleans, you know that the rich white people control all the major economic positions and most of the money invested in the politicians. None of the local politicians want to cross the hands that feed them. All of the local white ruling class are descendants of the slave masters, whose accumulated wealth was stolen from the labor of the enslaved African people. What has really been telling in this whole experience has been that not one prominent white person in this city has made a statement in support of taking down or removing the monuments. The most prominent rich white person, Frank Stewart, who says he speaks for all of them, said that they will continue to resist removal. In fact, they are circulating a petition to force the city government to restore the monuments that have been taken down. Stewart is a big capitalist who owns the cemeteries in the city and is the second-biggest cemetery owner in the world, Frank Stewart Enterprises. New Orleans’ economy now focuses on tourism. There are 80,000 people working in that industry. Their labor generates a great deal of capital for the hotel, motel and restaurant owners. But the majority of the Black working class is stuck in minimum-wage jobs: bussing tables, washing dishes, making beds in the hotels. These vast differences result in a great deal of distance between the incomes of rich and poor — we are the second city in the country in the gap between rich and poor. So the condition that the Black working-class people in the city face is to have to work two jobs to survive. Because of the gentrification after Hurricane Katrina in 2005, our rents have skyrocketed and people who want to keep a roof over their heads have to work two jobs. New Orleans is the leading city in rate of incarceration in the entire world. Basically, the local ruling class has decided they are not going to create any jobs for the Black youth in the city and therefore have forced them to live lives of pushing drugs. Then the authorities put the Black youth in jail — they put them away and throw away the key. It has a deleterious effect on the working class in terms of disruption and being able to build a wholesome community among our people. After Hurricane Katrina, many Mexican and other Central American workers came for work in the reconstruction of New Orleans. The immigrant population went from about 3 percent before 2005 to around 12 percent at this point. Many of these immigrants are day laborers, who have been victims of wage theft. There is an organization of day laborers that we in Take ‘em down NOLA have been working with for quite some time. We have much solidarity with our immigrant brothers and sisters and we have shown it by holding demonstrations of solidarity with the day laborers and against building a wall on the border with Mexico. Regarding all the attention to the NOLA mayor’s speech in May, we have to recognize that he did make the initial motion that he would take down four monuments. But we said, well, if you are going to have a discussion about removing the symbols of white supremacy, why stop at the four? Don’t just do a partial job. Do the whole job. We had many community meetings demanding that the city take down the monuments. The city government decided in December of 2016 to have them removed, but immediately the Monumental Task Committee, representing the white ruling class, filed suit to try to prevent them from coming down. And we frankly had to push and prod and push and prod the mayor to carry out the decision of the City Council and bring down the monuments. We said if this mayor were really sincere about his lovely words — and it was a moving speech, but there was a big difference between words and deeds on his part. We don’t think that he is a sincere champion of the struggle against white supremacy, and we’re going to push and prod him until we get all the monuments down. Take ‘em down NOLA’s next move is to fight to get an ordinance passed that declares that New Orleans is going to be a city free of white supremacy-public monuments, based on the principle of being anti-racist and anti-white supremacist. We’re pushing to get that passed and we will continue our public agitation to take down the Andrew Jackson statue. It’s the most prominent Confederate monument left standing and the most popular among white supremacists, and if we can get that taken down the others will probably follow in order. People can go to the webpage ­(takeemdownnola.org) to keep up with our activities. We are planning to have an anti-white-supremacy-monuments con­fer­ence here in March of 2018. People should look for the final plans, which should be ready by the end of July.